If Chess clocks aren’t your thing, try a Chess set from Seletti with a built-in time factor: the pieces are made out of candles. Piero Benzoni designs some expensive and ornate tables, pieces, and sets. 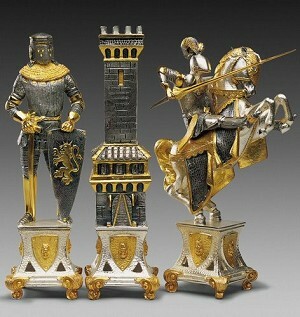 Pianki carries some, such as these Medioevale Stile (Medieval Style) Gold and Silver Themed Chess Pieces selling for just over $113,000. You can find one Benzoni set on Amazon: the Piero Benzoni Renaissance Gold and Silver Theme Chess Set for a paltry $9,000.